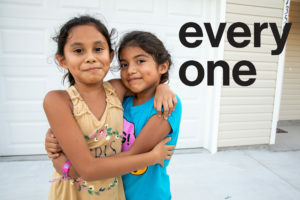 Creating a more compassionate and just world, Habitat for Humanity Tucson brings people together to build homes, communities, and hope. Every child deserves to grow up in a safe and stable place. At Habitat for Humanity Tucson, this is what unites us. Through shelter, we empower. Our shared vision is a world where everyone has a decent place to live. Habitat for Humanity Tucson offers an innovative solution to the crisis of affordable housing by giving a hand up, not a hand out. We accomplish our mission by building and repairing homes in partnership with the community and local families. Families help build their home and the homes of their neighbors, attend financial planning classes, and pay an affordable mortgage. We know that safe, decent and affordable shelter plays a critical role in helping families to create a new cycle, one filled with possibilities and progress. Families like Manny & Mia. He’s her father, her protector, her superhero. He works two jobs to make sure she has a better life than the one he knew, but he still can’t afford a safe place to call home. That’s where Habitat for Humanity Tucson comes in. After contributing over 250 hours to his home and the homes of his neighbors, saving for a down payment and taking financial classes. Manny finally has a safe and stable home to raise his daughter. Since 1980, Habitat Tucson has built over 400 homes, performed over 200 home repairs, and positively impacted over 600 families. To help families like Manny’s have a chance to build themselves a better life, make your tax-deductible gift to Habitat for Humanity Tucson.